WASHINGTON, Mar 31 2014 (IPS) - The Barack Obama administration appears to have rejected a deal-breaking demand by Israel for an Iranian confession to having had a covert nuclear weapons programme as a condition for completing the comprehensive nuclear agreement. Pro-Israeli commentators have openly criticised the Obama administration for failing to explicitly demand that Iran confess to charges by the International Atomic Energy Agency (IAEA) of a covert nuclear weapons programme. All the intelligence in question can be traced back to Israel, and investigation of it has shown that the documents and reports that have been most widely publicised betray multiple indications of having been fabricated. All the intelligence in question can be traced back to Israel, and investigation of it has shown that the documents and reports that have been most widely publicised betray multiple indications of having been fabricated, as reported by IPS. The term “possible military dimensions” had been used by the IAEA in referring to the claims publicised by the agency over the past six years of covert Iranian nuclear weapons development projects, including an alleged facility at Parchin for testing nuclear weapons designs. The administration thus seemed to suggest that some kind of Iranian admission to past nuclear weapons work is a condition for a final agreement. But the Obama administration’s rhetoric on resolving IAEA claims of a nuclear weapons programme appears to be less about forcing Iran to confess than responding to pressures from Israel and its supporters in the United States. The demand that Iran “come clean” on its alleged nuclear weapons program entered into the Obama administration’s public posture for the first time after consultations with Israel in advance of the October 2013 round of negotiations with Iran. Secretary of State John Kerry declared in Tokyo Oct. 3 that Iran would “have to prove it’s willing to come clean about the nuclear programme”. That same day, Ambassador James Jeffrey, a senior fellow at WINEP, in testimony before the Senate Foreign Relations Committee, said Iran “must come clean on its nuclear-related military research”. By the time the negotiations on the joint Plan of Action were completed in November, however, the State Department adopted language on the issue that harkened back to Kerry’s testimony at his Senate confirmation hearings in January 2013. Kerry had said then that “questions surrounding Iran’s nuclear weapons programme” had to be “resolved”. Along with Kerry’s initial adoption of the “come clean” rhetoric, these sharp criticisms of the U.S. refusal to call explicitly for a confession indicate that the Obama administration had initially went along with Israel’s in calling for Iran to “come clean”, but concluded that such a demand risked a premature breakdown in the talks. A former U.S. official who had worked on Iran suggested in a recent off-the-record meeting that the “possible military dimensions” issue could not be resolved completely, but that one or more parts could be clarified satisfactorily. The rest could be left for resolution by the IAEA after the comprehensive agreement is signed, the ex-official said. That possibility arises because Iran and the IAEA agreed in February to work on the “Exploding Bridgewire” (EBW) issue – the claim published by the IAEA that Iran had carried out experiments on high explosives developed for the purpose of detonating a nuclear weapon. That claim was based on a document that was part of the large collection originally said by anonymous intelligence sources to have come from the laptop computer of a participant in a purported Iranian nuclear weapons research project. The documents were actually turned over to German intelligence by the Iranian terrorist organisation Mujahedin-E-Khalq, which had close links to Israel’s intelligence agency, Mossad. Iran provided the IAEA with an account of its actual EBW development programme in 2008. The Iranian account, cited by the agency in its May 2008 report, indicated the rate of explosions in its experiments, which was just one-eighth the rate mentioned by then IAEA deputy director Olli Heinonen in a briefing for member states in 2008. But instead of acknowledging that fact in its report, the IAEA suggested repeatedly that Iran had acknowledged carrying out the EBW experiments described in the purported document from the secret weapons programme while claiming it was for non-nuclear applications. The new Iran-IAEA agreement on the EBW issue raises the question of whether IAEA Director General Yukiya Amano is now ready to reach a deal with Iran, despite having staked his own reputation on the November 2011 report on intelligence claims of covert Iranian nuclear weapons research coming from Israel. Such an agreement might be based on the IAEA’s stating accurately the Iranian explanation for the EBW – and thus implicitly admitting that the agency had distorted the issue in the past. Other issues might be left to be resolved quietly after the negotiations on a comprehensive agreement are completed. Israel is not a party to the nuclear negotiations with Iran. That’s why the project has a chance of success. We should be offering up thanks to whomever for that. So how is it that it has insinuated itself so far into them that it is in a position to attempt insertion of a poison pill such as a “demand” of this sort? It’s the equivalent in the Iranian context of the demand that the Palestinians recognize Israel as a Jewish State. It has the same purpose, the wrecking of negotiations. Let’s see now, can we remember the last time Israel of her own volition took a positive position on a matter of world peace not having been dragged to it kicking and screaming? We should not be surprised that Israel has, in the words of our friend Phil G., “cooked the books” on the (alleged) Iranian nuke issue. 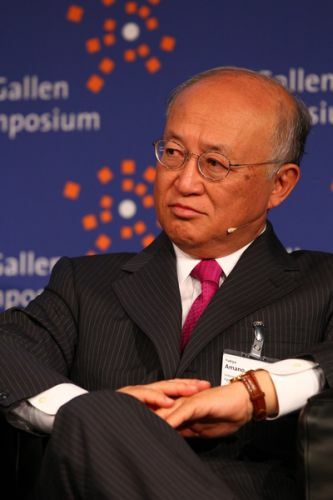 Only hope that IAEA leader Amano can gracefully back down from his prior stake and that the U.S. and remaining UN members will strongly back him.